Of course, they’re not the first to try their hands at iterating on Super Smash Bros. Melee, the 15-year-old competitive juggernaut that refuses to die. Rivals of Aether, officially released in March 2017, and Brawlhalla, which is currently in open beta, expanded on the Smash formula with ideas of their own. Icons certainly follows in their footsteps, but the developers have taken additional steps to ensure a connection with the community in which they grew up shines through every decision. During the Evo finals, this passion was displayed to the world for the very first time. Wavedash Games CEO Matt Fairchild and Creative Director Jason Rice found their footing in the world of competitive gaming, as many do, through Super Smash Bros. Melee. They both got started as tournament organizers before moving onto jobs in the gaming industry, and the connections they made in the Smash community have proven to be valuable assets during Icons’ development. This is reflected in tangible ways. A portion of the Wavedash staff is made up of former or current Smash players, and they even take feedback from a special Community Council of top competitors like Hugo “HugS” Gonzalez and Charles “Cactuar” Meighen. Their mission statement is as clear as day, embedded right in the company’s Twitter handle: @wewavedash. Icons itself is as much a celebration of the genre as it is a blazing trail in uncharted waters. It features full 3D models, a detail that seems small at first but quickly evokes memories of beating down your friend’s Captain Falcon on Final Destination more clearly than its predecessors. 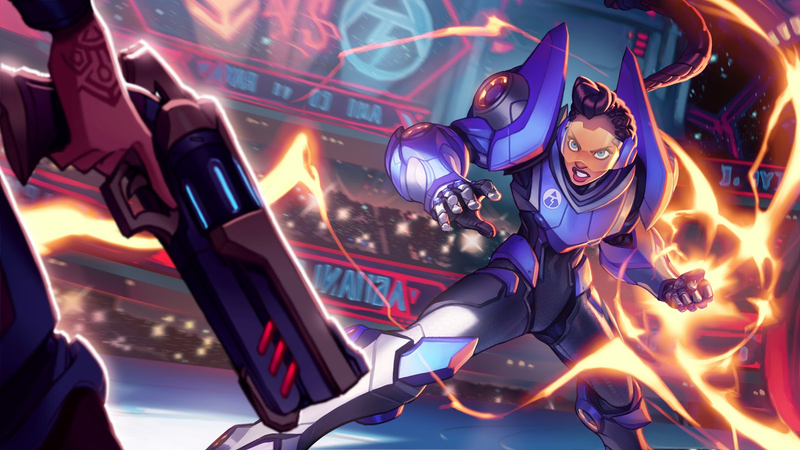 Character archetypes match up with Melee favorites, but skew towards new ground when it comes to cast members like Xana, an alien Amazon that acts as a true grappler in a genre bereft of the archetype. At its core, Icons is about introducing core platform fighting tenets (emergent combat, off-stage scrambles, combo creativity, etc.) while maximizing their value for players who may not be familiar with the high-level techniques that have become synonymous with the genre. For example, Super Smash Bros. Melee’s L-canceling, which reduces recovery on aerial attacks when landing, doesn’t make an appearance in Icons, but enough ancestral DNA is present that wavedashing is a possible, if not all-important, movement option. This evolution is most obvious in the shield mechanic. While the technique works pretty much the same as in the foundational platform fighters (characters are surrounded by a bubble that mitigates damage but diminishes over time) shielding in Icons brings with it an entirely new functionality called Gust Shield. Pulling inspiration from skills like pushblocks and alpha counters in more traditional fighting games, Gust Shield allows players to push their opponent away at the cost of some of their barrier’s health. This new mechanic can also reflect projectiles, making shielding much more versatile than it has been in the genre’s previous iterations. Although the similarities are obvious, Icons is less about replacing Super Smash Bros. as it is about improving the experience for fledgling platform fighter players. GameCubes and CRT televisions aren’t as easy to come by these days (plus, the monitors in particular can be hell on the back), and Icons gives genre newcomers an easily accessible product that can be used as a gateway to serious competition. Icons: Combat Arena is scheduled to enter open beta on Steam this fall. Interested parties can sign-up early through the official website.